Were spoofs 'hateful' – or critics too keen for a ban? They are the biggest phenomenon in publishing at the moment. But now one book parodying vintage children’s texts has been withdrawn following a fierce social media backlash. 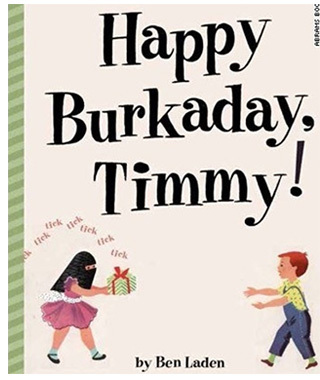 Images in the book, marketed as a collection of 120 ‘edgy, politically incorrect parodies, include a girl wearing a burka giving a ticking present to a little boy for a book called Happy Burkaday, Timmy by Ben Laden. Withdrawing the book from sale in the UK and the US, both the author and publisher, Abrams, took aim at the commentators it accused of being involved in a witch-hunt. In a statement, Abrams said: ‘In the last few days some commentators on social media and those who follow them have taken elements of the book out of context, failing to recognise it as an artistic work of social satire and comic parody. They argue that it lends credence to the hateful views that the author’s work is clearly meant to mock, demean, expose, and subvert. ‘Bad Little Children’s Books is a work of parody and satire and, as such, it is intentionally, openly, and provocatively offensive… We stand fully behind freedom of speech and artistic expression, and fully support the First Amendment. We have been disheartened by calls to censor the book and to stifle the author’s right to express his artistic vision by people we would expect to promote those basic fundamental rights and freedoms. The author said his work was ‘unabashedly un-PC, rude, tasteless, inappropriate’ and said he was working in the same vein as ‘MAD Magazine, Richard Pryor, The Onion, Amy Schumer, The Simpsons, Dave Chapelle, National Lampoon, and South Park’. They added: ‘While reviews of Bad Little Children’s Books have been overwhelmingly positive, I understand that one can become personally offended by any of the parodies (heck, even I find them offensive). ‘The book is an "equal opportunity offender," if you will. This was my intention and, as a longtime supporter of liberal politics throughout my more than 40-year career as an illustrator, writer, and humorist, the fictitious character of Gackley couldn’t be more different than me. ‘The artistic statement that I tried to make in the book is to offend and, by doing so, to shine the uncomfortable light of day on bigotry, prejudice, and hate; in effect, to refuse to let those pernicious and undermining sentiments stand. That’s been part of my life’s work and what I hoped to achieve with this book.